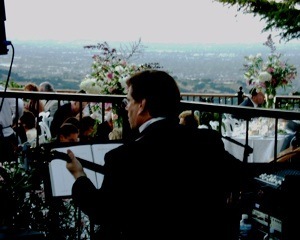 Add a touch of elegance to your reception with David playing background music to create the perfect ambience. When your guests come in to the dinning area and they hear live music it will be a striking contrast to their ears compared to recorded music. It’s refreshing and a type of ear candy. Instrumental music is relaxing and non-intrusive when your guests are engaged in conversation. When a vocal is used, subconsciously you attempt to listen to the words at the same time you are processing the words of your conversation. This process takes your brain a lot more effort. Try it at home; listen to a recording with a vocal and then an instrumental while talking to someone. It should be obvious.